Portable devices, for example tablets, GPS, etc. It is designed for automated production line testing of key loudspeaker parameters, such as frequency response, rub and buzz, THD, and impedance. The 12AU’s design makes it ideally suited for test of portable devices with built-in loudspeaker such as mobile phones, hearing aids, tablets, and GPS devices. The inherent noise is very low, and by design it avoids system-generated noise, for example from ground loops. In a measurement setup, it controls the paths of (a) the signal sent out to the loudspeaker and (b) the resulting acoustic signal picked up by a condenser microphone fitted to the preamplifier. It is remotely controlled via its USB interface and is delivered with a control program for Microsoft Windows ®. Rack mountable in 19” rack. In a complex measurement setup, it is often difficult to avoid system generated noise. Also, it can be tedious to correctly set up all the parameters of the measurement chain with respect to sensitivity, gain, filtering and overload handling. With the 12AU, you can control the loudspeaker amplifier and microphone conditioner simultaneously. 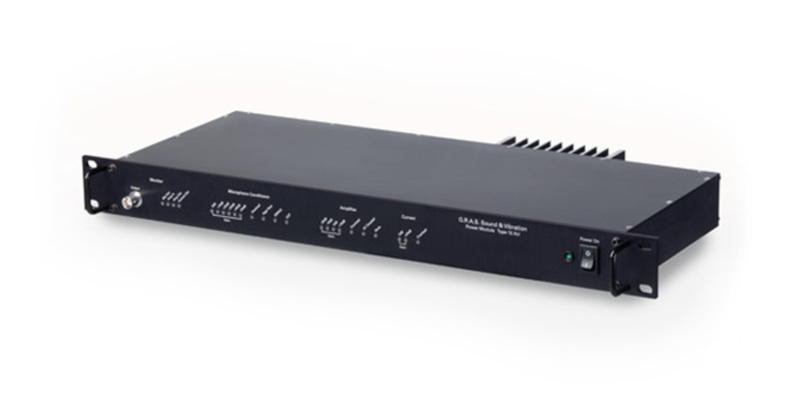 The 12AU is remote-controlled via its USB interface and a control program for Windows. You can operate the 12AU using a graphical user interface or by entering commands. Multiple 12AUs can be controlled from the same PC. These features make the 12AU ideal for automated production line testing. All outputs except the speaker amplifier output have fixed 100 kHz (3 dB) low pass filters to minimize the need for anti-aliasing filtering in the following analyzing equipment. There is no phase shift between microphone input and output due to prepolarized or externally polarized microphones. It is designed without relays. All GRAS products are made of high-quality materials that will ensure life-long stability and robustness. The 12AU is delivered with a 2-year warranty. The warranty does not cover products that are damaged due to negligent use.